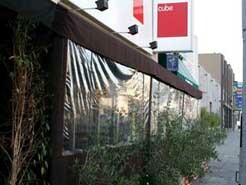 Cube Market Place offers diners a hint of old world Italian charm; it is a market, a cheese bar and a restaurant at the same time. 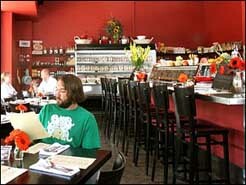 With a great ambiance, gracious, the decor is subtly modern; the menu is classic, celebrating Northern Italian cuisine. extensive wine list, elegant patio setting, and romantic main dining room. Cube Market Place café’s menu is based on traditional Italian cooking with a strong Californian influence. They shop at the Santa Monica Farmer’s Market, use organic whenever possible, and only buy meat that is raised naturally and cruelty free. Californian flair and changes every Thursday. salumi from the Marche region of Italy. that equates dining with tuxedoed waiters, white tablecloths, and classic preparation. you arrive early, do try to stop here for an aperitif. a piece of cheese… it was one of the most tempting baskets of bread I’d been served. glasses, my date the Dolcetto D’alba, and myself the Nebbiolo 2004.
offers a rotating selection of fresh fish and daily specials. plates. It was a rare and genuine act of hospitality. tomato vinaigrette. Another dish that I would certainly try it again. the Black Truffle from le Marche and Italian Mozzarella pizza, thin crust with the most delicious truffles on top, that by itself, is already a meal. that you will not be disappointed. It is out of this world. slowly, thoroughly enjoying each bite. ragu. you will be in heaven when trying this dish, and the gnocchi was so light, that you can’t tell you are eating, but you are enjoying every single bite. and taste. And mine was the Olive Oil poached Tuna Loin. Italy’s cuisine had evolved to so expertly celebrate the bounty of the sea. we should eat the Hanger Steak more frequently. the food to outperform the after-dinner sweets. manager waived to us one last time from her seat near the door, we smiled. charm and generous hospitality, providing an almost timeless dining experience.